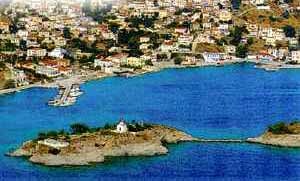 Inousses, Inouses, Inusses, Inuses, Northern Aegean Islands, Greece Public Holidays, Public Holidays in Greece. The five islands, two miles off the northeast coast of Chios are known by the name of the largest island, Oinoussa (read e-nousa). In antiquity the island was famous for its wine (Oinos) and it is believed that this is also the origin of the name "Oinousses". During the Greek revolution of 1821, the inhabitants fled from the islands; they came back after 1827. When they returned to the island, the people had to withstand the many difficulties caused by the Turkish occupation. Because of the heavy taxes, most of the men became seafarers. Many of these managed to become ship-owners, and today some of the richest and most famous ship owners worldwide come from this small island. Oinousses has also one of Greece's major maritime schools. There is a small hotel, a few rooms to let, cafes, taverns, and many pleasant beaches. There a boat with frequent service from the city of Chios to Oinousses and during the summer many travel agencies organize various excursions to the islands. These excursions often include visiting some small coastal villages, making the trips an excellent combination of sea, sun, and greek food.